"A fantastic drink often found north of the border. 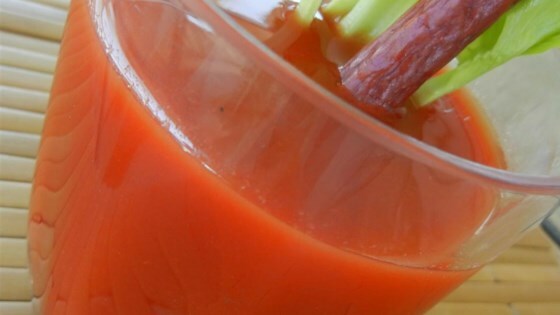 This will definitely liven up your traditional Bloody Mary." Rub the rim of a cocktail glass with celery salt. Place ice in the glass, and pour in vodka and tomato and clam juice cocktail. Mix in the bouillon powder, hot pepper sauce, and Worcestershire sauce. Garnish with celery. Say hello to the perfect brunch companion. Absolutely leave out the beef boullion! I've never had a Caesar this way. Rim the glass with celery salt and instead of the celery stalk, try a dilly bean for some added punch. I like this recipe. Watch out for the salty taste. Don't forget the dill weed. Makes a big difference. Very good recipe. I'm used to Caesars having a little more kick to it so I added a small bit of creamed horseradish. I don't know if the beef powder was needed. I've seen this recipe using tomato/beef juice INSTEAD of tomato/clam juice, it's a Bloody Bull. I wouldn't recommend combining the flavors, though, too salty. I definitely prefer it without the beef bouillon powder. Add a few drops of lime juice, or a twist of lime.